Ravello is a small town situated just above Italy's Amalfi Coast and was once a destination for known artists, musicians and writers such as Escher, Wagner and Wolfe. Inspired by the rambling wrought architecture and lush foliage of this romantic country town, the Ravello Padded Sling Bar Stool was designed by Robert Mainvelle, and invites any guest to waste away a few leisurely hours in comfortable contemplation. The soft flowing curves of this bar stool's frame showcase casual elegance, while the broad extrusions of the arms and legs add both comfort and strength. The fully cast arms are gracefully accented with two opposing scrolls tied together with a band and embellished with the leaves of a laurel wreath. The result is a piece of beautiful Outdoor Furniture that combines versatility with classic, old-world charm. 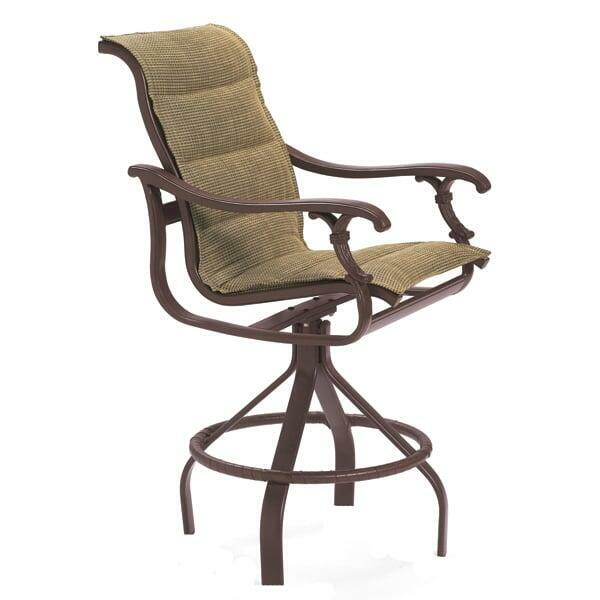 Add an alluring Outdoor Bar Stool to your indoor or outdoor space! Contact Family Leisure today and ask about the Ravello Padded Sling Bar Stool by Tropitone!